A newspaper photograph that caught the eye in the past few days is that of former Jawaharlal Nehru University Students Union President, and CPI candidate for the Lok Sabha elections from Begusarai, Kanhaiya Kumar, flanked by the mother of another JNU alumnus, Najeeb Ahmed. The visual speaks of the embattled state of their alma mater. Najeeb enrolled in JNU in 2016 and should have been on course to complete the academic requirements for a degree in biotechnology, last year. But he has been untraceable for more than two years, and his family and fellow students have raised strong suspicions of foul play. Kanhaiya’s troubles with the current regime — inextricable with JNU’s recent travails — are, of course, well-known. While the unfreedoms of JNU have got national attention, what is disquieting is that the prestigious university’s fortunes are actually the tip of the iceberg in so far as the general state of universities in India is concerned. All is not well in universities in the country. It’s therefore natural that a volume of essays on the “idea of a university” devotes a major part of its investigation to academic freedom. What marks this volume, however, is that it does not look at academia from the narrow perspective of the classroom. The essays, instead, try to locate institutions from the standpoint of the several stirrings in the country. Universities have become rife with possibilities of new ideas of citizenship — ones that contest old notions of religion, caste, even the nation. This is not a simplistic break from the past, as has been viewed in some quarters, but an engagement with, and questioning of, power structures that ought to be the raison d’etre of academic spaces in the first place. But at the same time, universities are increasingly been asked to conform. While they are becoming “catalysers of social mobility,” the suicide of Rohith Vemula and the periodic reports of caste, gender and religious discrimination in educational institutions also attest to the fact that the university is increasingly being viewed, as Niraja Gopal Jayal writes in her essay, ‘The Idea of Academic Freedom’, “as a space that should be sanitised of the dangers of critical thinking and free enquiry, of dissent and critique, debate and engagement”. It’s such tension that inform the essays in The Idea of a University. One response would be to see the Indian university’s predicament as a sub-set of “the existential crisis” of institutions of higher learning worldwide. Knowledge is increasingly been seen in terms of “market compatibility”. However, the appropriation of the educational space by neo-liberal forces has taken place in different ways in different parts of the world. The essays in the volume try to understand the workings of such forces in India, and their convergence — and divergence — with political currents. As Alok Rai writes in his essay, ‘The Barbarians Have Landed’, we stand at the cusp of a paradigm shift in the way the university has been imagined in the country. “The colonial conception of the university has been rebranded for the twenty first century as the ‘skills university’, a policy goal, which would, ideally render entire generations into servants of giant corporations, slaves of the engines of capitalism”. This has meshed with the thinking that everything that is useful in the realm of ideas has already been imagined — largely in ancient times — and the function of the university is simply to regurgitate them. How should pedagogy respond to such challenges? How should teachers contest the antediluvian demands that are increasingly been placed on them? Ram Ramaswamy, in ‘Night Thoughts on Academics, Administration and the University’, puts the onus on the faculty. The quest for academic excellence has to be reconciled with the changing composition of the student body “in terms of class, caste, ethnicity, religion and religious affiliations”. The nature of pedagogy ought to be thought through and though teachers cannot be faulted on account of conscientiousness, the present effort towards “student-centred education” is “on the whole, inadequate,” he contends. But how well-positioned is the faculty to effect such a change? In ‘Questioning Academic Freedom’, Pankaj Chandra questions the power structure within the university itself. “While the university leaders seek academic freedom for the university and for themselves from the regulator, they rarely pass this on to their own constituents…So rigid is the hierarchy of colleges and the university that academics primarily see themselves as executors of decisions and not their originators”. However, does the answer lie in an institution impervious to political currents — as Chandra seems to suggest? 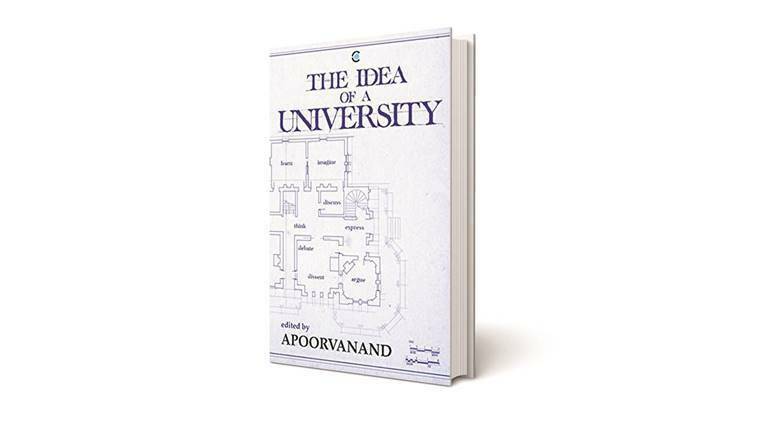 Or, is it instructive to go back to Apoorvanand’s introductory essay? Here he talks of an “obscure article” by Premchand in which the wirter contrasts two convocation addresses: One by scientist C V Raman at Allahabad University and the other by Sarvepalli Radhakrishnan at Lucknow University. Premchand roots for Radhakrishnan’s views that universities “should become nurseries for youthful courage and excitement,” against Raman’s advocacy of caution against the “lure of the political”. But Apoorvanand, while not dismissive of the philosopher president, urges a different reading of the scientist. “Universities should not give in to the demands of political correctness of the day,” he says. It such emphasis on different readings — dialogue, debate and dissent — that form the core of The Idea of a University. The volume should be seen as a call for reclaiming institutions of higher education as spaces for such activity.